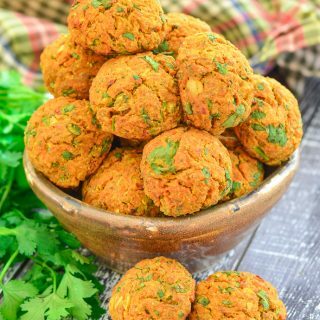 These Curried Carrot Baked Falafel are a healthy, super easy to make twist on traditional falafel. They are oil & gluten-free & packed with flavour. Serve them as part of a hearty plant-based meal, eat them as snacks, or pop them in packed lunches! If you think they sound a bit familiar, this recipe is an adaptation of my Curried Carrot Fritter recipe which I make all the time. I love the leftover fritters cold the next day, so tried rolling them up into balls to make them more snack and lunch box friendly. With a few small tweaks it worked! I toyed with the idea of calling them ‘Curried Carrot Fritter Balls’, then thought it sounded weird and went with ‘Falafel’, and whilst they aren’t like traditional falafel because there are no actual smushed chickpeas in them, I think as they are made from chickpea flour I can get away with it. These baked falafel have a really lovely light texture and are baked to oil-free perfection. They are just the bomb taste-wise. So incredibly flavourful and just the right kind of spicy. And they are packed with healthy, nourishing ingredients. They are really easy to make too! Grating the carrots is the only time consuming part, but if you have a food processor, even the grating is easy as it does all of the hard work for you in seconds. These falafel are great for building a hearty plant-based meal. We have been making the tastiest power bowls with a grain of some kind in the bottom, some roasted veggies, some steamed leafy greens or crispy salad, a few of these Curried Carrot Baked Falafel and a drizzle of tasty sauce. So good! They are also perfect for salads, snacks and lunch boxes. In fact, that’s part of the reason I wanted to make them. We are going to San Francisco! Yay! I am so excited! ???? But as you know, when you fly as a vegan, food can be a bit hit and miss, so I always like to take a packed lunch full of goodies to tide me over. 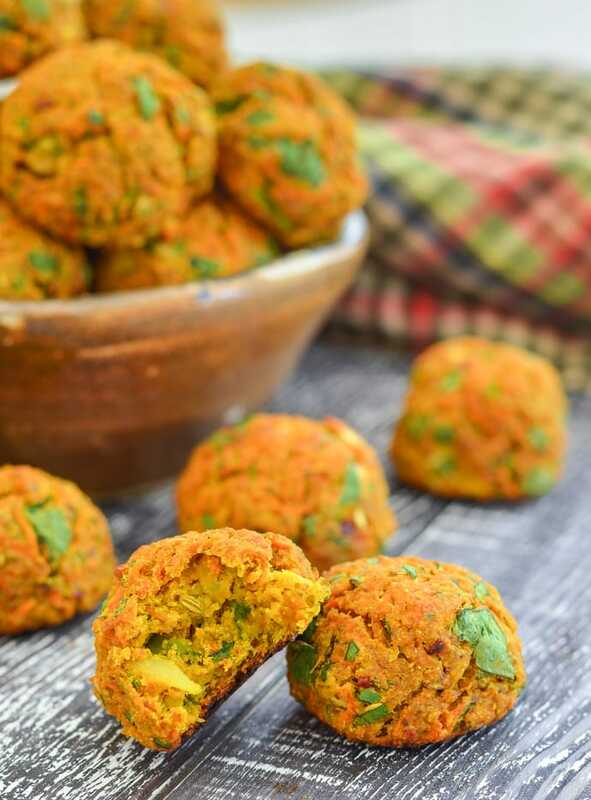 These Curried Carrot Baked Falafel are just perfect to pack up and will be my little travel buddies. They got a little road trip trial at the weekend too. That was how I discovered that I can’t keep my hands off them ’til lunch time and also that my husband is a food thief. ???? When we go to SanFrancisco there will be loads of walking involved while we are trying to find all of the yummy vegan food places. In case you hadn’t already guessed, all of my vacations tend to revolve around food. Forget sightseeing, just take me on a food tour…..That is a bit of an exaggeration because I do love sightseeing too… As long as it involves plenty of food along the way. ???? And all of that walking plays havoc with your feet. I am a comfort shoe (and food) queen ???? You will never find me in heels, but regardless I struggle to find truly comfortable shoes. I think I have funny, over sensitive feet. ???? I have a closet filled with shoes that I have bought and can’t wear because they hurt. Having to find vegan shoes makes my struggle even harder. I have recently been looking for comfortable shoes to take with me on my San Fran trip. It doesn’t help that I am fussy and hate shopping. 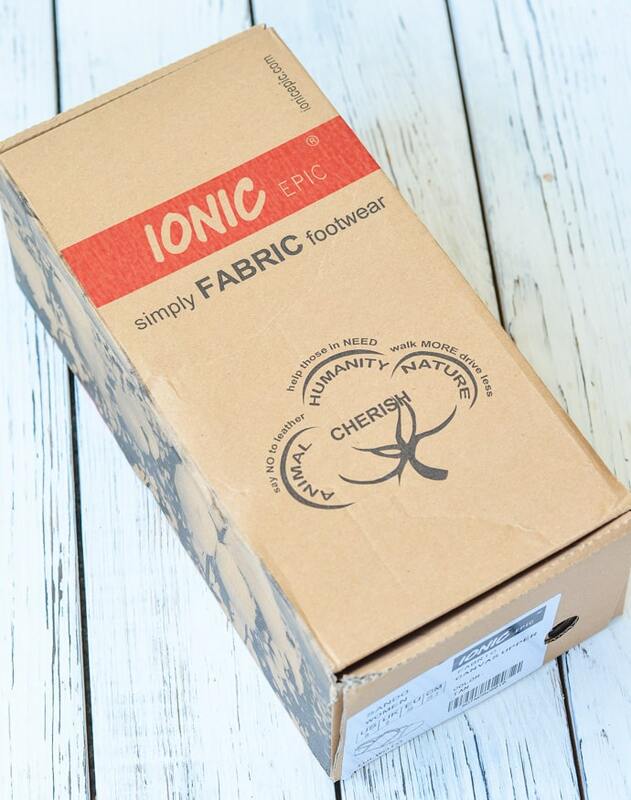 I was searching online, trying to find reasonably priced, comfortable and vegan shoes that I would like and that wouldn’t hurt my feet, when I stumbled upon Ionic Epic, simply FABRIC footwear. To cut a long story short (because you really don’t want to know anymore about my feet or shopping habits), I ordered a couple of pairs and I love them! They are so comfortable. And they are super light and flexible. You can literally roll them up, shove them in your case (shove being the ultimate word with me as I am terrible at packing), and they bounce right back perfectly after. 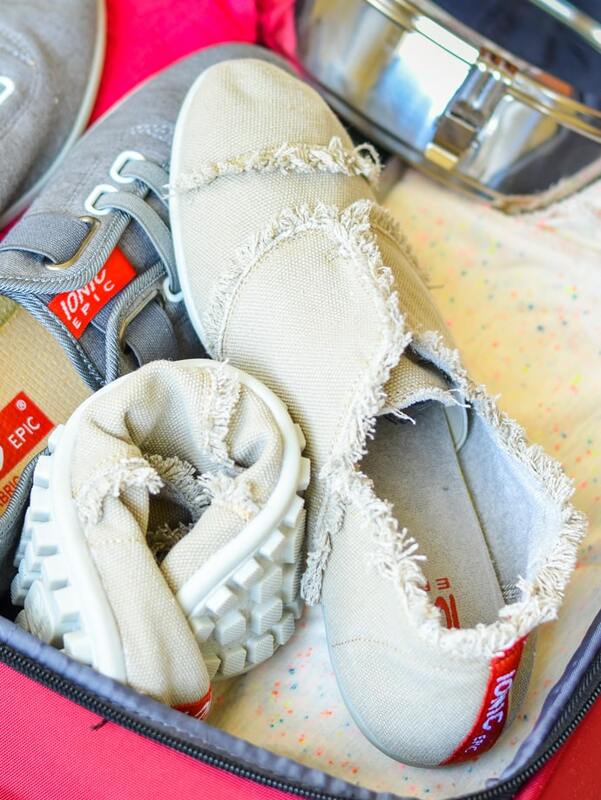 Perfect for packing up to take on vacation. And they won’t add much weight. They are so light! 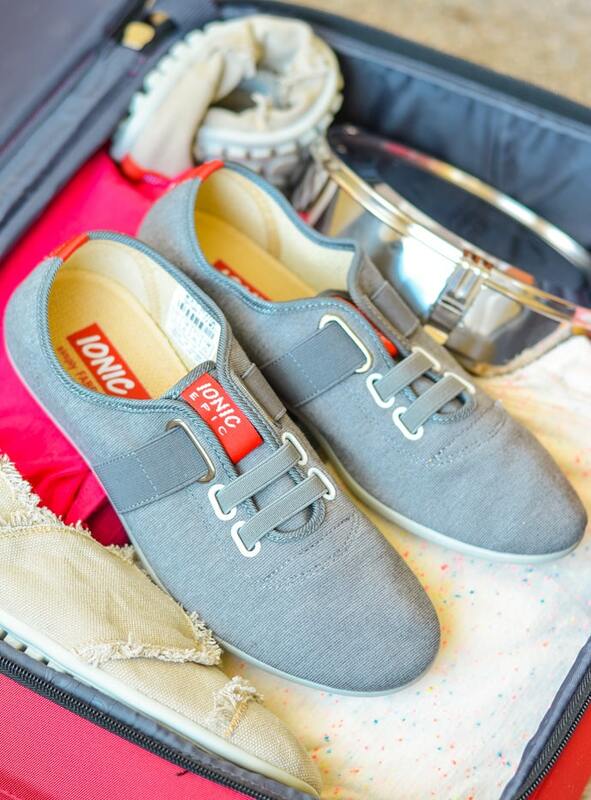 All Ionic Epic shoes are made from organic, vegan, biodegradable and sustainable materials. They are also breathable, odour resistant and easy to keep looking new because they are machine washable! I wore a pair of them on our road trip last weekend and packed a pair too. We did lots of walking and they really are super soft and comfortable. They make my feet happy! ???????? They got pretty dusty as it’s so dry out right now and we walked some trails, but came out of the washing machine looking good as new. They will be absolutely perfect for wearing around San Francisco and just look at how easily they screw up in your case! ???? You can totally flatten them too so they barely take up any space. I love this as I always pack way too many clothes and end up having to sit on my luggage to fasten it! (Notice the stainless steel lunch carrier in the background which is full of Curried Carrot Baked Falafel ????). You too could be enjoying what’s left of summer by packing up your baked falafels and going for a nice walk in some of these comfy shoes. That’s because Ionic Epic have kindly offered you guys 30% off your order. Shipping is free too! All you need to do is use the code VIRTVEGAN30. So not only do you get yummy Curried Carrot Baked Falafel, you also get new shoes! Let me know what you think of the falafel (and the shoes) in the comments below and share your pics on Instagram. I love to see! Oh and if you have any recommendations for where to eat in San Francisco let me know! 100 g | 1 cup chickpea flour sometimes called besan or gram flour. A garbanzo fava bean blend flour works well too. The curry powder is essential and the other spices are recommended but can be omitted if you don't have them. Preheat oven to 400°F and line a baking tray with parchment paper or a Silpat. Grate the onion and the carrot. The grater attachment on a food processor does this job quickly and easily. In a large bowl add the onion, carrot and garlic and mix well. Add everything else except the water and stir together really well making sure all the spices are distributed well then add the water gradually, stirring as you go. You might not need it all. You should have a really thick batter that is sticky but that can be squeezed together in your hands. Roll into tight walnut sized balls and place on the prepared baking tray then bake for 25-30 minutes until firm to the touch and just starting to turn golden. I use a combination of many different spices to give maximum flavour but these are totally customizable. 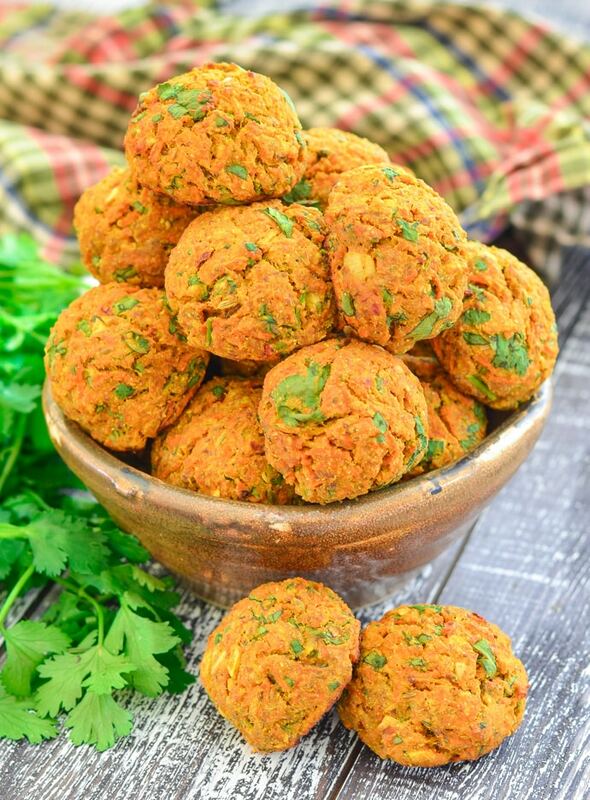 The blend listed in the recipe is how I like my falafel, using what I regularly have in my pantry but in this recipe you have complete control. If you don’t have one of the spices or if there is one you don’t care for, omit it. You can use something else instead or not. They are good with just the curry powder and none of the other spices if that is all you have. Sometimes I add cilantro, sometimes I add parsley and sometimes I use the finely chopped green carrot tops. Play around with what you like best. A long as you keep the carrot, onion, chickpea flour, flax seed and water at the same ratio the falafel will work. Leftover falafel freeze well. Allow to defrost then either read cold or warm through in a medium oven until piping hot. This post is sponsored by Ionic Epic. Thank you for continuing to support the brands who help make this site possible.